Black Mass was a different movie I wasn't planning on seeing but it turned out to be a good flick. Johnny Depp plays notorious South Boston criminal James "Whitey" Bulgar who's committed pretty much every crime in the books and his true story comes to life. Black Mass starts in the late 1970's and the story slowly takes place from there. 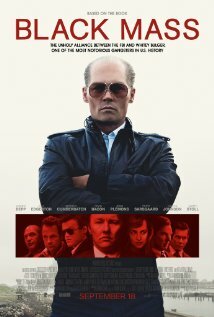 Black Mass depicts a crime boss who was ruthless and if loyalty was broken, that was it for you. Whitey didn't get where he was by himself — connections he made during childhood helped him reach the top. He gets a leg up from his brother Billy (Benedict Cumberbatch) — a big time senator — and then befriends an old ally, John Connolly (Joel Edgerton), who is now an FBI agent. With the help of John, Whitey makes a deal he cannot refuse: helping the FBI catch another crime boss above him by being an informant. In exchange, John gives Whitey information and other favors to help him climb to the top of the local crime ladder. John's loyalty to Whitey is his number one priority. Black Mass shows scenes not meant for kids that might make adults cringe too. Johnny Depp takes Whitey from a semi-criminal to one to be feared. But those loyal to him have a limit and you will find out what I mean in the climax of the story. Great acting brought the real story to life and made Black Mass a crime/drama/biography you won't want to miss.